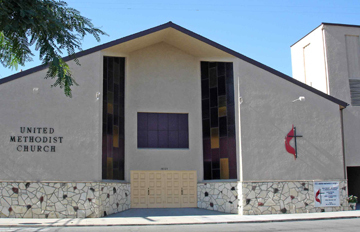 This year the Artesia-Cerritos United Methodist Church celebrates 135 years as a community of faith. We show the wisdom of many years, but also display the vigor and vitality of youth. We are made up of energetic and friendly persons of diverse ages and ethnic backgrounds, who come together to make difference in the place they call home. On November 11, 1876, the local Methodist Church was formed in a public school house, with a preacher who pastored in both Westminster and Artesia. From that day to this the love of God has bound the church family together in faith, friendship, and service. God has blessed this congregation with a heritage of hope and a legacy of love. By enduring together in the good and in the difficult times of life, the congregation reflects God's faithfulness. Persons active in the community life of Artesia and Cerritos are found in the church. The Methodist tradition has always called persons to social action, seeing faith connected to all of life, and the work of God to be done in the home and community, and not just in the church on Sunday morning. The church has opened its doors to all in the community. Following the 1933 earthquake the church housed seven public school classes from March through the end of the school year. After the flood of 1952 the church served as an evacuation center. At other times the church has hosted well-baby clinics, blood banks, and Scouting organizations. Today much of this continues. In a Covenant Relationship through the California-Pacific Annual Conference, we help support missionaries in Mexico and provide scholarship aid for residents served by those missionaries. We are building a Young Adult Ministry through our praise band, our Sunday School is growing, and we have a contemporary worship service on the last Saturday of each month at 4:00 p.m.
Years pass and people come and go, but the Artesia-Cerritos United Methodist Church remains a dynamic center of worship, learning, friendship and sharing. Our community is blessed with persons from a wide range of ethnic backgrounds. This church is fortunate to be able to reflect that variety. People feel at home here, wherever home may originally have been. This too is a result of the faith shared by the people of the church, a faith which celebrates the wonderful diversity in which we were created. New opportunities face us each day, with new challenges to belief and spirituality. The church responds to these needs, providing a place where persons can learn about the love of God, experience community, celebrate life, and give thanks to God with words and acts. As always we continue to be a Christ-centered faith community, which welcomes all persons of all ages to sing together in joy. The church is going on 135 years old, yet it is youthful, alive, and active for our world today, through the grace of God. We are very much your community church. We are in the heart of Artesia, approximately one mile east of the Los Cerritos Shopping Center. Near the corner of 183rd Street and Pioneer Blvd, we are one block east of Pioneer (on Arline) and one block south of 183rd (at 186th). There is ample parking across the street from the church. Click here for map and detailed directions.